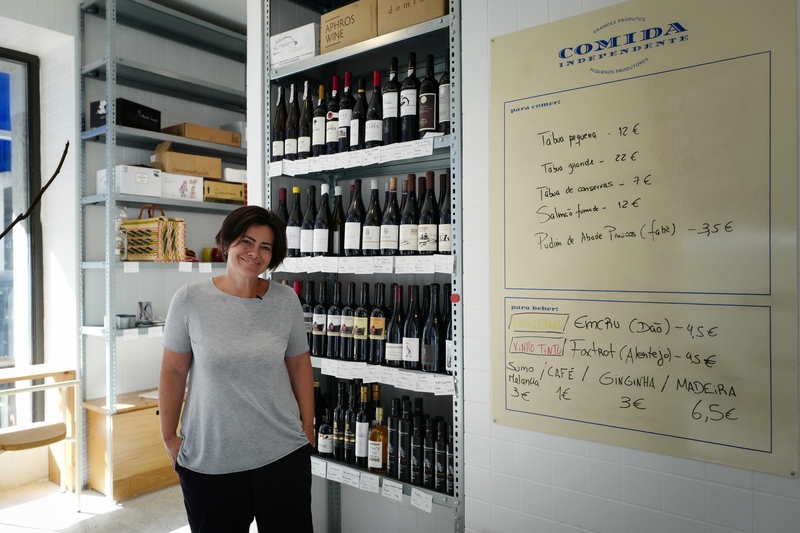 Rita Santos opened a couple of months ago her own grocery shop, it is called Comida Independente. T.F. : What is the concept of your shop? R.S. : This shop is about the small producers who make extraordinary products that represent the best of Portuguese gastronomy. When the grower is involved, that’s when the best of the food is done. So we travelled the country to look for these producers and we got them together in the same place. T.F. : From where this idea come from? R.S. : It’s a funny story because I always worked for big corporations before this project. I decided that it was time for a change, it’s kind of a middle-life crisis cliché. I think at some point in time I felt the need of having a project at a human scale, something that will go beyond, a global impact in the end. I guess coming from other areas I also can give another perspective. We have a contemporary language that allows us to speak with other audiences, other people who will become interested, saying “oh it’s nice, what’s going on here?” and they talk to me. And you know, this connection of things that were not previously connected brings a bit of richness to the project I think. Also, I guess there wasn’t such place. Being passionate about food and about wine, I thought it was worth doing the effort of bringing them all together. We opened about 6 months ago. It’s still growing. But there are already 150 producers here, it’s quite complete in that sense. We’re still experimenting but we want to have like a one-stop shop, a place where you can have everything, not just a place where you can go and purchase some small gifts. Of course food is a great gift you can bring to someone but we wanted to be a shop that is alive with real products, real kitchen, real people who cook at home, so it’s about all of that. T.F. : So what kind of products can we find here? R.S. : We have fresh and organic products from a farmer with whom we partner. It comes from a very close-by farm, outside of Lisbon. Then we have wine, which is big for us. All natural wines, all from small producers. Natural in the sense of low intervention wines, no preserves, no high degree of sulfites, temperature controls, all those kinds of things that usually are associated to big productions. Only small productions can do it like that, it’s a great expression of terroir. If you think of food as an expression of a country, of a land or of a region, you can think of many foods but I think wines imbend the whole philosophy of a terroir expression. Then we have bread, sourdough, we have chocolate which is bean-to-bar, we have teas. I think practically all food categories, even meat and cod fish. Cod fish is king on the Portuguese gastronomy. We also have olive oils. We are always working on the meat, but it is a challenge working with small farmers on meat. We also have a few complements, frozen ones, some fresheners. The charcuteries and the cheeses which are quite big for us also, as the expression of the land. In Portugal we have 100 of different charcuteries and also cheeses of course. It’s a very rich country in terms of the details for each producer and the way it’s done. Every small village almost has its own recipe. We also felt the need not to be narrow-minded just having Portuguese products. We have 80% of some products like wine or cheese that are Portuguese, 20% is foreign. But for that we also look for small productions. Like, cheese fine tuners who also work with small producers in Great-Britain or in The Netherlands like La Meuse. These places also bring us the kind of products we’re looking for, in terms of the origins and the way it is done. T.F. : Do you think it was a big need for this city to have this kind of shop? R.S. Well, I think, food is a big debate. 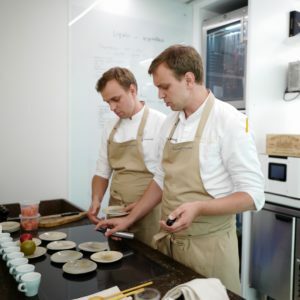 We have our own propositions, we are out of the mass market and I think there’s a place for that, for people who are really passionate about food and they want to find special things. We hope that we provide this service to them. Curating, finding these people, knowing their stories, sharing this with people, we invite producers to come often to share about the products with people. We make some dishes around the products, we taste the wines, we talk about it. So it’s quite convivial. It’s like a community of people and there has been so many cooks, sommeliers, people travelling from other countries and coming here to get to know us and the shop. If it makes sense, yes I think so, some people visit a destination precisely to learn and to talk about what Portuguese wine is, what Portuguese food is, what is it about. I’m suspicious, of course I am because I am the person who did it but I think it makes a lot of sense. Food is also part of our identity, our culture, and if we don’t curate it and take good take care of it it will just dissolve in many others products that have their merit but it won’t be taking care of the heritage as well. T.F. : For you, what are the 3 or 4 products we should not miss when we come to Lisbon? R.S. : Oh wow! First of all the wine, absolutely. We have beautiful wines and we still have wine makers who do it on a very authentic way. Then, olive oils, not very well popular compared to Italy, or even Spain and Greece. So I think our olive oils also deserve this kind of light. And also, I would say the sweets, there’s a lot of history around it. T.F. : Thank you Rita. What is again your signature? R.S. : Our signature is “great products by small producers”. By knowing the producers and knowing how things are done, it helps us enjoying the food even more and it’s important for the taste and naturality. And when people understand that more natural products are tasting better than I think we do our job.